iBuddy is a BINUS student who support our international exchange students to adapt with BINUS, Jakarta and Indonesia. For many international students, being in Indonesia might be their first time experience living abroad. They have to leave their family, friends and everything familiar to them behind. In Indonesia, they will need to make new friends, gain a lot of new information, learn how to get around and even learn a new language. It surely can be a daunting and overwhelming experience. 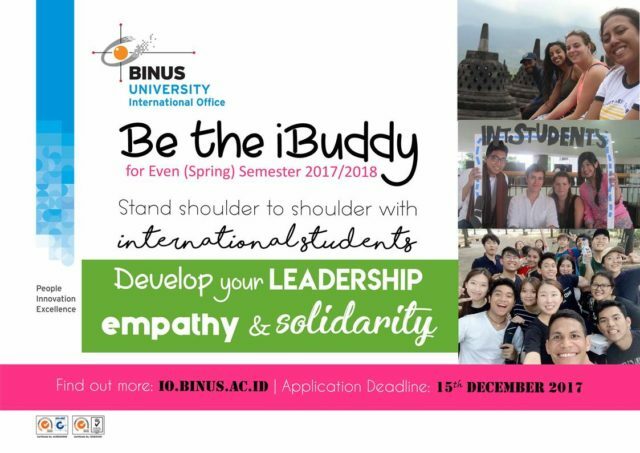 iBuddy is a way that can help international students to create an easier and smoother stay; while the benefit for the iBuddy is the exposure experience to a new culture while developing their leadership, empathy, and solidarity. Please kindly visit our page http://io.binus.ac.id/binus-students/post/ibuddy-program/ for further details.